Benjamin Braddock (Dustin Hoffman) contemplates his future in "The Graduate." "One word: plastics." But what if you don't like plastics? 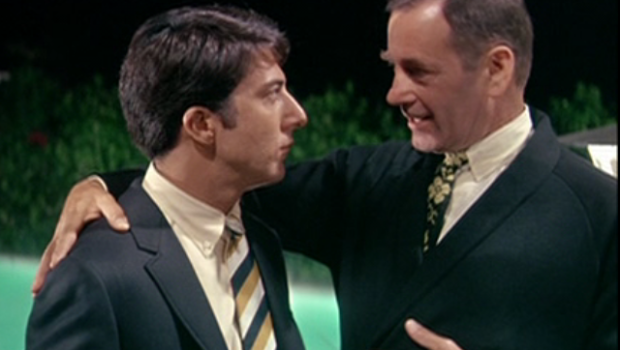 Watching The Graduate in 2013 is a sobering experience. Even though many of the swinging &apos;60s colloquialisms and hair-dos are out of date, the film&apos;s message still rings as true today as it did in 1967: the life of a post-grad is scary, confusing and often crushed under the weight of our parents&apos; high expectations. According to the latest census from the U.S. Bureau of Labor Statistics, the unemployment rate in this country for ages 20 to 24 is a whopping 13.7 percent. Unfortunately, this does not surprise me at all. When I was an undergrad at Columbia College, I worked a string of unpaid internships (you know, for the several years of "experience" employers demand on your resume before even considering you for a real job) and had a couple of freelance writing gigs lined up to coincide with my graduation in the summer of 2012. Then, at age 23, I experienced my Girls pilot episode moment: my dad announced that he would be cutting me off financially ("tough love," he called it) and that I would be on my own. How was I going to pay my bills without a full-time salary? Should I give up my dream of being a writer for a more sensible career at Starbucks? Could I make the $300 in my bank account last until Christmas by only buying ramen noodles for dinner and never going out again? Or should I just leave Chicago altogether and crawl back home to Dallas: the land of baby-making, boredom and soul-crushing superficiality? Thankfully, I was able to land a more stable job this year at the ripe old age of 24; but the fear of failure still lingers within me. In fact, just the thought of missing a paycheck and having to move back in with my parents sends post-traumatic-stress shivers down my spine. College graduates seeking employment during one of the worst recessions in recent history are conditioned to live in fear, but "catastrophizing" will not help you get a job faster or make your life any better. Let&apos;s say you&apos;re a creative type, and you need to come up with the next great idea to land your dream job. Instead of torturing yourself over that new song, logo or e-book that refuses to materialize on your computer screen, take a break from the laptop and put your brain on autopilot. Inspiration comes when we allow our minds to wander; so go for a run, clean your room or take a long, hot shower and you&apos;ll have that glorious "aha!" moment when you least expect it. Case in point: JK Rowling came up with the idea for Harry Potter while waiting for a train at King&apos;s Cross Station that was four hours delayed. The concept of "networking" has probably been drilled into your head so many times that you want to turn a flamethrower on the next person who says "It&apos;s all about who you know." Unfortunately, the reason you keep hearing this advice like a broken record is because it&apos;s true: the more connections you have in your business of choice, the more likely you are to get a job. You won&apos;t make friends by sitting at home every night, so why expect someone to hire you if they never see your face? Take a class, attend a job fair and meet as many people as possible. Hopefully, someone will see how talented you are and give you a leg-up from the thousands of other equally-qualified college graduates vying for the same job. I&apos;m a Type-A perfectionist, so not comparing myself to my 25-year-old sister with a 401(k) or a similarly talented co-worker who receives more praise and recognition than I do is extremely difficult. However, I&apos;ve learned that focusing on other people and constantly blaming them for my own unhappiness will only make me more miserable in the long run. Studies show that people who constantly check life updates on Facebook feel worse about themselves, so don&apos;t give in to the hype of "keeping up the Joneses" through social media. Believe me: you&apos;ll be happier and healthier just focusing on you and not giving a toss about how many likes/shares/retweets you get on a daily basis. Sometimes, all it takes is a few words of wisdom from people who&apos;ve been exactly where you are (broke, unemployed and terrified that they won&apos;t make it out of their 20s with their sanity intact) to make you feel a little bit better about your own situation. For example, when Rick Kogan told me he was driving a taxi cab at 25 and hadn&apos;t even begun his now-legendary career in Chicago journalism, I didn&apos;t feel quite so crushed about not being a famous film critic before age 24 as I had originally planned. Most of our anxieties are fictitious (perceived, not actual), meaning we constantly worry about things that don&apos;t actually happen. Instead of immediately jumping to the worst-case scenario when you&apos;re feeling stressed, try focusing on the present moment and asking yourself: "How can I be the best _______ I can be, and enjoy the process?" My dad used to repeat this cliched little nugget of advice to me over and over again, to the point that I never wanted to hear him say it again. Then one day, it hit me like a sledgehammer: "How can I be the best writer I can be, and enjoy the process?" I&apos;d finally figured it out: be your best self, and the rest will follow.